That is all folks, thanks for tuning into Sport24's LIVE coverage until next time have a great evening further. What an encounter, and a draw is certainly a fair result. Both sides played exciting football and it was looking like Stars would of steal a emphatic surprise victory over the Soweto giants. Cavin Johnson will be a satisfied coach to come away with a point but Eric Tinkler will feel disappointed as Mamelodi Sundowns suffered a draw against Black Aces. Kaizer Chiefs take on relegation threatened AmaZulu and Stuart Baxter will implode the idea that a win will put them in a better position to lift the PSL title. Ngele is awarded MAN OF THE MATCH. 94' Pirates and Stars looking to steal this encounter but nothing happening. 88' Majoro almost makes it 4-3. His effort doesn't hit the mark. Neat pass from Manyisa to play in the Major. 85' GOAL! Issa Saaaaaaaaaaaaaaaaar! Bullet header, the rest is a bulging net. It's 3-3! 85' SAVE! Dambe denies Jele from close range. 83' Dambe back up and play resumes. 82' Dambe down now as the medics check the GK out. Meanwhile Tinkler looks a worried coach as Johnson shares a smile with his players. 79' Myeni floats in a corner to the far post, Mahamutsa is unmarked & plays it back into the centre of the 6yd box. Stars clear for a corner. 76' Patient build up sees Nyauza in an advanced position on the right. He plays in a low ball to Majoro at the near post, just wide. 73' Majoro comes on for Ntshumayelo. 71' Makola almost equalises for a third time but his long-range effort dips too late and lands on top of Dambe's net. Ngele completes his hat-trick and what treble of goals that was. 62' Ngele with a long range effort straight towards Mpontshane who makes a decent save. 49' Just the response Tinkler would want. Bacela whips in a teasing cross for Manyisa and the captain controls in perfectly as he tapes it pass Dambe. 45' As expected, Siyabonga Mpontshane replaces Brighton Mhlongo. Both sides are back out and Eric Tinkler looks the one most stressed. 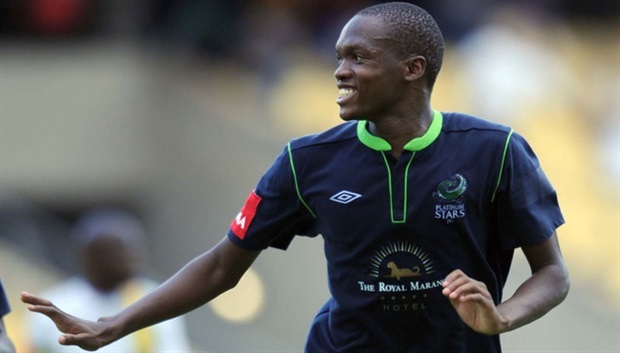 Ngele's left foot put Stars back in front. His free-kick effort hits the post and beats Brighton. 49' Free-kick for Stars on the edge GK box and what a strike. GGGOOOOOOOOAAALL!!! Meanwhile four minutes have been added on. Pirates level matters as Manyisa assists Makola and the midfielder makes no mistake as he strikes the ball with precision. 44' Nothing comes from the corner. 43' Pirates on the other end now as Makola prepares to take a corner-kick. 42' Brighton has looked troubled since that knock, parrying easy shots and can't collect easy corner takes. Tinkler might have to change the Bafana Bafana goalkeeper. 41' Sarr takes the 1st shot in anger as it deflects & is easily collected by Dambe. ...Makola is on target but Dambe is alert it the danger. Keeper saves, throw in Bucs. Ngele puts a wondrous shot past Brighton as Pirates fall asleep at the back and fall to ball watching. 29' Mere complaining to the referee now as Pirates receive a line-out. 27' Pirates knocking the ball around nicely. Nyauza plays in a dangerous ball but Makola lets it run. There's nobody behind him to collect the loose ball. 19' Brighton back up after a minute or two down. Good news for the Buccaneers. 17' Brighton runs into Mabena after Nyanda's cross was on the verge of finding his teammates head. Pirates defender knocks it out. Brighton down. Medics checking the GK out now. 15' Movement on the bench as Rakhale warms up following a knock to Ntshumayelo. Bibo is up though, no harm done. 7' Cavin Johnson is vocal on the sideline in his second match in charge since his return to the Rustenburg club. Good to have him back in the PSL fold. Corner taken by Mahlatse Makudubela from the left by-line. Corner from the right by-line taken by Mahlatse Makudubela. Foul by Rooi Mahamutsa on Ndumiso Mabena, free kick awarded. Letladi Madubanya takes the free kick. Free kick awarded for an unfair challenge on Oupa Manyisa by Vuyo Mere. Patrick Phungwayo restarts play with the free kick. Corner taken by Sifiso Myeni from the left by-line. Corner from the right by-line taken by Sifiso Myeni. Kabelo Dambe gets a fist to the ball to punch . Sibusiso Msomi on for Mogakolodi Ngele. Corner taken by Thabo Rakhale from the left by-line. Thabo Rakhale is brought on as a substitute for Mpho Makola. Corner taken by Sifiso Myeni. Bryce Moon is brought on as a substitute for Mduduzi Nyanda. Lehlohonolo Majoro is brought on as a substitute for Thandani Ntshumayelo. Mogakolodi Ngele scores with a left foot finish. Orlando Pirates 2-3 Platinum Stars.Assist by Ndumiso Mabena. Free kick awarded for a foul by Letladi Madubanya on Luyanda Bacela. Free kick taken by Thandani Ntshumayelo. Luyanda Bacela concedes a free kick for a foul on Rofiwa Tshikovhi. Free kick taken by Kabelo Dambe. Mahlatse Makudubela replaces Tintswalo Tshabalala. Corner taken by Tintswalo Tshabalala. Mogakolodi Ngele takes a shot. Rooi Mahamutsa catches the ball. Free kick awarded for an unfair challenge on Mduduzi Nyanda by Rooi Mahamutsa. Mduduzi Nyanda takes the free kick. Luyanda Bacela gives away a free kick for an unfair challenge on Vuyo Mere. Vuyo Mere takes the free kick. Foul by Mpho Makola on Vuyo Mere, free kick awarded. Mpho Makola is given a yellow card. Free kick taken by Vuyo Mere. Corner taken by Mogakolodi Ngele from the right by-line. Oupa Manyisa scores a right footed goal. Orlando Pirates 2-2 Platinum Stars.Assist by Mpho Makola. (Orlando Pirates) makes a substitution, with Siyabonga Mpontshane coming on for Brighton Mhlongo. Robert Ng'ambi concedes a free kick for a foul on Ntsikelelo Nyauza. Free kick taken by Sifiso Myeni. Foul by Mpho Makola on Vuyo Mere, free kick awarded. Free kick taken by Vuyo Mere. Free kick awarded for an unfair challenge on Ndumiso Mabena by Thandani Ntshumayelo. Free kick taken by Mogakolodi Ngele. Mpho Makola slots the ball right footed into the goal. Orlando Pirates 1-1 Platinum Stars. Shot by Mogakolodi Ngele went over the crossbar. Corner taken by Mpho Makola from the left by-line. Corner taken by Mduduzi Nyanda from the left by-line. Ndumiso Mabena is ruled offside. Ntsikelelo Nyauza takes the free kick. Patrick Phungwayo fouled by Mogakolodi Ngele, the ref awards a free kick. Sifiso Myeni restarts play with the free kick. Mogakolodi Ngele scores with their left foot. Orlando Pirates 0-1 Platinum Stars.Mduduzi Nyanda provided the assist for the goal. Issa Sarr concedes a free kick for a foul on Mogakolodi Ngele. Mduduzi Nyanda takes the free kick. Mduduzi Nyanda booked for time wasting. Corner taken by Mogakolodi Ngele. Issa Sarr gives away a free kick for an unfair challenge on Robert Ng'ambi. Thabiso Semenya takes the free kick. Happy Jele concedes a free kick for a foul on Mogakolodi Ngele. Free kick taken by Kabelo Dambe. Corner from the right by-line taken by Sifiso Myeni. Robert Ng'ambi challenges Mpho Makola unfairly and gives away a free kick. Mpho Makola takes the free kick. Free kick awarded for an unfair challenge on Mogakolodi Ngele by Happy Jele. Free kick taken by Mogakolodi Ngele. Foul by Robert Ng'ambi on Mpho Makola, free kick awarded. Issa Sarr takes the free kick. Centre by Tintswalo Tshabalala that comes to nothing. Centre by Sifiso Myeni. Header at goal by Luyanda Bacela misses to the right.